Adding to the pool of last-minute iPhone 7 rumor and speculation, Apple's official website might have just confirmed the existence and names of its two upcoming handsets. According to the apparent slip-up spotted by a Redditor browsing through Apple's Hong Kong site, Cupertino will soon lift the curtain on the iPhone 7 and iPhone 7 Plus. Whilst sifting through audio accessories, Reddit user Jaspergreenham claims he spotted both the iPhone 7 and iPhone 7 Plus referenced beneath the list of compatible devices. The tidbit was quickly removed after a refresh, but thankfully not before a screenshot could be captured. If you look to the left of the screen grab above, you'll notice the iPhone 7 and 7 Plus' honorable mentions, despite not yet being official. As with nearly all of the information related to the next-gen iPhones, we cannot be totally sure of its authenticity. Having said that, the team that maintains Apple's website will no doubt be busily performing updates and tests in preparation for the inevitable surge. Thus, such early glimpses are to be expected, and are certainly not unprecedented in these circumstances. 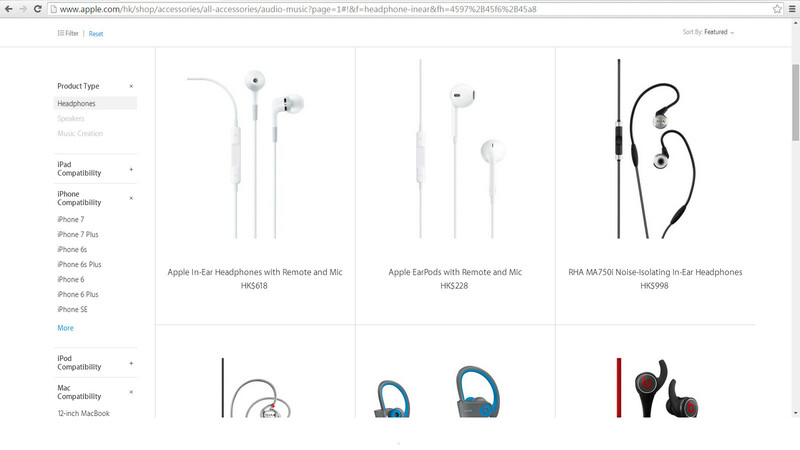 There's a slight hint of irony that the accessories page in question relates to headphones since Apple is expected to do away with the 3.5 mm jack, much to the disdain of Apple co-founder Steve Wozniak. Instead, the new iPhones will supposedly utilize the Lightning connector for this function. A move that could see Apple make a concerted push in the audio hardware game after its Beats purchase — a decision that The Woz did give his blessing to — users will be forced to either use Bluetooth or make use of accessories featuring Apple's proprietary connection. Whether bundled or sold separately, it's probable that a Lightning-to-3.5mm converter will be available to those wishing to keep using their current gear, though. If you're looking forward to tomorrow's announcement, check out our in-depth round-up of what can be expected. The beast is coming, the world is waiting!!!!!! Piano Black 256gb iPhone 7 Plus for me. Can't wait! Haven't stepped away from Android for a while, but I need that speed and power the iPhone 7 has. What kind of Android phone are you rocking? I choose the Note series because of the S-Pen functionalities and rough multi-tasking. So, I'm not switching to another phone which doesn't feature an equivalent of the S-Pen just because the said phone boasts faster speeds and more powerful SoC. The iPhone7 is a beast, but doesn't offer what I value the most. But do you need to "step away" from Android in order to get the iPhone7? How about rocking both? Oh, I'm not afraid of rocking two phones. I rock the Nexus 6P and the Note 4 right now. I don't need to step away from Android (I should have phrased my first comment better), but this will be the first time since the iPhone 3g that I'm making an iPhone one of my main phones. u are right... im an android user for a long time and this is the first time i got excited with an iphone...i just hope all those leaks about the waterproofing and camera is true.. I'm excited. Seems like it will be the best performing phone out there. The iPhone 6s is still the king of performance until tomorrow, I hope they will surprise tomorrow. Not the king in all occasions such as web browsing (sometimes), and using social apps (eg: facebook). But yeah, most times it surely is! Web browsing on safari has always been faster than on android. It's the only browser I've ever used that appears to keep web pages in memory making switching back and forward pages instant. I didn't complain about the fluidity; its amazing. What I am referring to is the slightly more time it takes to load just some webpages. Sometimes it take several seconds to open a site which loads normally in 2-3 seconds. I have used an iPhone 6 plus and 6s plus so know the beastly perfromance. But improvements are definitely needed in some key areas, especially the ones I mentioned. And what's there in an apple lover who doesn't dig in the nooks and cranies to fetch the weak points, then details them out for the brand to improve upon? My points proved once and for all that I am nowhere near a fanboy. Can't wait, the IPhone 7 will be killer!!! Yup. I was excited to purchase a Note 7 up until the issues of lag and exploding units. Looks like the iPhone 7 may be my next device. This iPhone is looking like a beast. My Note 7 is dope, but I may just trade in for the iPhone. Those benchmarks are droolworthy. But I'll hang on to my note 7 a bit longer...lag has improved a little bit after disabling a couple bloatware apps I can't remove and I definitely don't think I have a bad battery. But who knows, maybe I'll just but it as well and rock two phones! This phone is gonna be a speed demon. I'm more so excited for iOS 10 Mac OS Sierra. So while you geeks can open apps a bit faster, everything else on your phone is worse than $200 Android phones. Too bad it's not trolling. The iPhone gets laggy updates, has inferior screens that are worse than $100 android phones, has 3rd rate camera, has a training wheel OS. Not a fandroid. And I don't look at benchmarks because they're useless. I don't care if my apps open up .005 seconds faster or slower. What I care about are the following qualities that ultimately determine good user experience: 1) Display quality - The iPhones displays are piss poor and even $100 Android phones have better displays. 2) Camera quality - same as above. 3) updates that don't intentionally lag your device so Apple can force you to upgrade. My iPhone 6 and iPad 3 are the laggiest phones I've ever owned since updating iOS. 4) Build quality - I've touched the note 7 on display and it felt solid. The iPhone feels like cheap aluminum from a soda can. I'll say it again.......chimps' shouldn't be allowed to use the internet . And yes, you are a Fandroid by definition. You're denying facts in favor of opinions.....classic Fandroid behavior. let him be...let him eat his bananas. can't wait for the new iPhone announcements ! yay ! Waiting your three pages comment Techie!!!! !